It’s red vs. blue, and President Donald Trump is doing his best to darken those colors. But it’s not all that simple in many of the races that will define the midterm elections. With Trump’s campaigning in quintessentially purple Florida on Wednesday — starting what promises to be a scorched-earth closing campaign stretch — evidence is everywhere of nuance — and a lack of comfort in typical party-line positions. Democratic candidate and former Gov. Phil Bredesen and Republican Rep. Marsha Blackburn wait for the start of the Tennessee U.S. Senate debate at The University of Tennessee, Oct. 10, 2018, in in Knoxville, Tenn. In Tennessee, GOP Senate candidate Marsha Blackburn and outside groups are ripping into Democrat Phil Bredesen by amplifying the threats posed by the refugee caravan. Bredesen, meanwhile, is on the air with his own ad … touting his decision as governor to send Tennessee National Guard volunteers to the border. Trump and the opposition to him are the big national themes of 2018. But both parties’ fortunes could be tied to the success of candidates who will — or who say they will — mix some red and blue. Unsurprisingly, during the Indiana Senate debate Tuesday night, the first question was about Trump’s latest statements on immigration and citizenship. Incumbent Democratic Sen. Joe Donnelly thus began talking about his bipartisan record, his votes to back a border wall and border security, and his frustration with Republicans not moving forward on legislation to protect so-called DREAMers. You could say Donnelly was on defense, talking about the president’s latest line instead of his own message on health care and wages. Rep. Steve King attends a rally with Angel Families on the East Front of the Capitol, to highlight crimes committed by illegal immigrants in the U.S., on Sept. 7, 2018. On the other hand, he got to talk about working across the aisle and all the times he voted with the president. In many ways, the moment encapsulated the potential danger for the president as he bites down hard into red meat. In Texas, the Democratic challenger for Senate, Rep. Beto O’Rourke, accused the president of playing to “the worst impulses of this country,” while going on to speak about hope and new leadership, as he has his whole campaign. The president is proving his point. A win is a win in politics, but it has to be said that for Democrats in 2018, some wins would be sweeter than others. National Republican Campaign Committee Chairman and Ohio Rep. Steve Stivers on Tuesday condemned the behavior and rhetoric of Iowa Rep. Steve King, who recently endorsed a white nationalist running for mayor of Toronto and gave an interview to a neo-Nazi-linked publication. That GOP distancing has reignited Democratic hopes that his deeply red seat could be in play given the seemingly ever-expanding House battleground map. King, who told ABC News in an interview last week that his campaign’s numbers indicate he is in a strong position to win re-election, is facing a strong challenge from Democrat J.D. Scholten, who holds a nearly 2-to-1 cash-on-hand advantage heading into the campaign’s final days, according to FEC records filed this week. Flipping King’s seat, which FiveThirtyEight gives a 1 in 6 chance of happening, is in no way necessary for Democrats to re-take the House, but the symbolism of defeating King, one of the GOP’s most prominent cultural provocateurs and immigration hardliners would be a victory they’d celebrate long after Nov. 6. Trump speaks at an “Our Pledge to America’s Workers” event at 2:30 p.m at the White House. 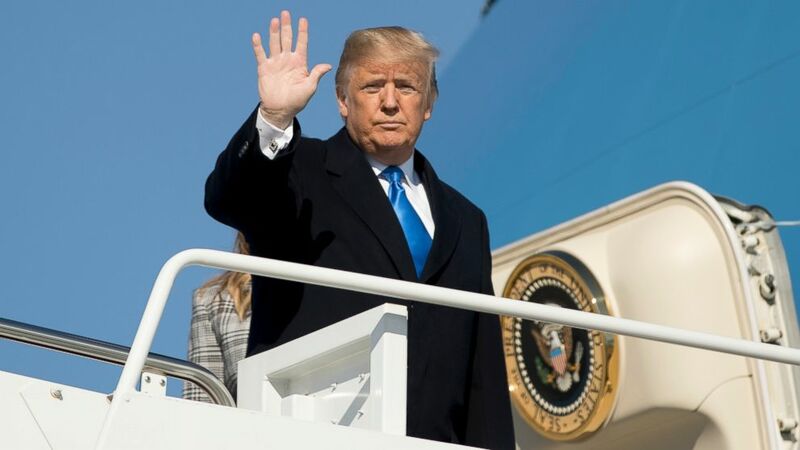 The president is holding a Make America Great Again rally at 7 p.m. in Estero, Florida, to shore up support for Republican Senate candidate Rick Scott and gubernatorial candidate Ron DeSantis, both locked in tight races. Florida Democratic gubernatorial candidate Andrew Gillum heads to Pensacola and Destin on his campaign bus tour. Vermont Sen. Bernie Sanders headlines an Early Vote rally at the University of Central Florida in Orlando at 11:30 a.m.
Biden joins several Democratic candidates on the trail, first at a stop in St. Charles, Illinois, for congressional candidate Lauren Underwood at 10:45 a.m EDT. That’s followed by an event with congressional candidate Brendan Kelly and gubernatorial candidate J.B. Pritzker at 3 p.m. EDT in East St. Louis, Missouri, and later a get out the vote rally for Democratic Sen. Claire McCaskill in St. Louis at 7 p.m EDT.